Munsell Color System; Color Matching from Munsell Color Company > Munsell FAQs > What Does My Score on the Farnsworth Munsell 100 Hue Test Mean? 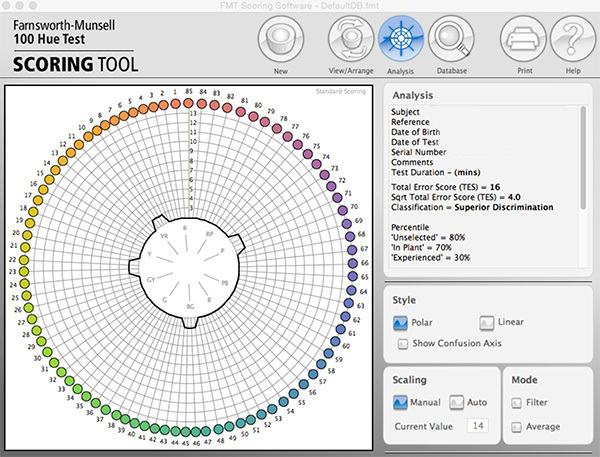 What Does My Score on the Farnsworth Munsell 100 Hue Test Mean? Did you Take the Farnsworth Munsell 100 Hue Color Vision Test and Want to Know How Well You Scored? The FM 100 Hue Test shows you if you are low, average or superior at discriminating color. Read on to find out more about the test and what your scores mean. Frequency the color caps are misplaced. The severity, or distance of the misplacement. Where the errors were made. About 16% of the population make 0 to 4 transpositions on the first test, or total error scores of zero to 16. This is a superior range of competence for color discrimination. About 68% of the population score between 16 and 100 on first tests. This is a normal range of competence for color discrimination. About 16% of the population make total error scores of more than 100. The first retest may show improvement, but further retests do not significantly affect the score. The Farnsworth Munsell Hue Color Test will indicate if you have a color vision defect and identifies where your confusion lies. Average color vision, but high error scores – Error scores by people with average color vision often exceeds those with color defects, yet those individuals don’t show color blindness indications on the test. Such scores occur because the FM 100 Hue Test evaluates color aptitude or ability to make color discrimination. Color discrimination is independent of color defectiveness so it’s possible for some people with average scores to have poorer color discrimination than those with color vision defects. People with average scores may have good or poor color discrimination; those with color defects may have good or poor discrimination. Unselected shows the errors which may be expected from each percentile of an unselected group of people aged 15 to 45. In-Plant Applications represent 300 tests of employees applying for promotion to positions of color control in a paint manufacturing plant – shader trainees, laboratory testers and laboratory technicians. Experienced is compiled from tests on 150 personnel with three to 20 years experience in control labs of manufacturers of dyes, rugs, plastics, textiles and paints. The personnel includes shaders, matchers, mixers, inspectors, passers, dyers and titration testers. 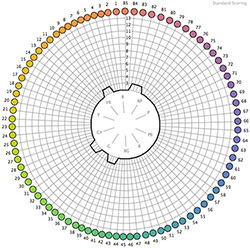 Looking for the Farnsworth Munsell Hue Color Vision Test instructions? 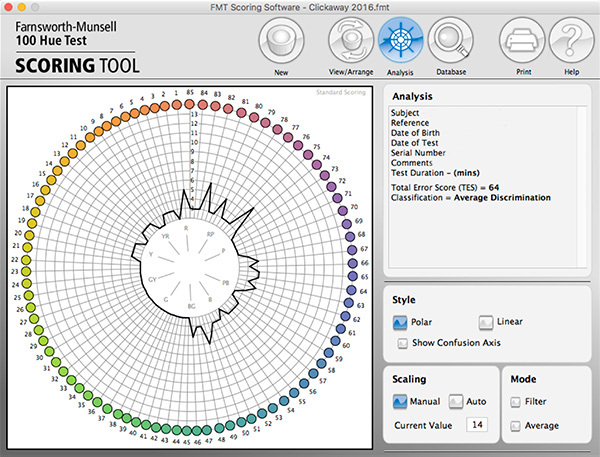 For the most recent version of the software, you can download here. 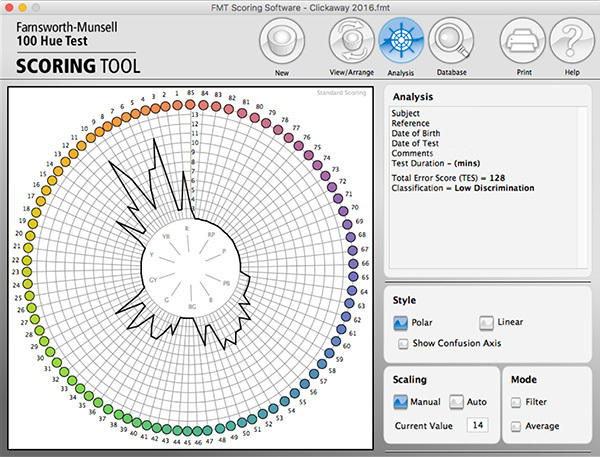 For more in-depth analysis, check out the accompanying color vision test software, which includes a database for storage of everyone’s visual color assessment capability. You can see how you compare to others. You can also learn more about the test by downloading the brochure.